This free resource has helped hundreds of people JUST LIKE YOU Discover issues with starting a Self Defense Program that they NEVER would have considered – issues to be Excited about, WARY about, and everything in between! The number one MOST important thing that should be stressed in a Kids Martial Arts Program is safety. From the drills that are done in class, to the way the warm-up is presented, Safety has to be paramount through and through. At our martial arts school we know your children are the most important thing in your lives, and we treat them as such! You would think that because it’s “Martial Arts” it might be inherently dangerous, and you wouldn’t be alone. But honestly, and it’s because we make safety a priority, we RARELY have an injury in class. In fact, regularly we see our students coming INTO the school with injuries from teeball, dance class, and just plain living normal lives – the karate school is often the safest place they go! The Kids Martial Arts program you choose MUST have a complete and appropriate introductory process for new students. It’s imperative that new students be given a block of time with an instructor to verbalize their goals –maybe even create them if the student hasn’t fully thought them though, be “shown the ropes” and see what’s going to happen in class, and be stepped through any other questions or concerns they might have. You’d be SHOCKED to see how many martial arts schools completely IGNORE this student need and just “throw you to the wolves” i.e., stick your child in class and HOPE they do OK. Of course, you won’t hear it said like this. You’ll typically hear something like “Sure, you can try a free class and see if you like it.” While a free class is great, going straight into class without a little help first is NOT. We disagree with this approach on a fundamental level. In fact, we disagree with it to the point that we have a specific Trial Program created just for your family, to ensure you have a fair shot at determining whether our classes are right for you. It’s our way of ensuring that our martial arts school is the place for you. The BIGGEST difference between a GREAT program and an inferior program is the INHERENT use of fitness in the classes. I’m not talking about jumping jacks and pushups necessarily. I’m talking about kids while they’re learning techniques that are super fun. This happens in our classes because they’ll be working constantly throughout the class with the instructors and other students in exciting situations and drills where they’re constantly using new muscle groups that just aren’t used in “normal” exercise or PE at school. You have to find a school that effectively reaches your family’s goals. That means that they understand what you’re looking for and deliver it. If you’re looking for more confidence, going to lots of Martial Arts tournaments probable isn’t right. If you’re looking for discipline and focus, be sure that they teach those things throughout their classes. We take the time in our Trial Process to understand you and we won’t let you enroll if we think your goals are ones we can’t help you reach. Training with us ensures that your time is spent effectively! Please be sure that the Martial Arts program that you choose understands children! The reality is that many Martial Arts teachers teach the same way their teacher taught them, which is the same way that teacher was taught – and it’s downright brutal! At our Martial Arts school, you won’t find yelling, frustration or anger in our instructors. You’ll see experienced, solid leadership, which is exactly what children need. We’ve been doing it for a long time, and we’re pretty good at helping children WANT to succeed, not just FORCING them to! Now, you have to understand something about Martial Arts. With the advent of the UFC and MMA, the Martial Arts in general have become a bit…tarnished in the eyes of the public because of a few bad apples. Let me assure you that MOST MARTIAL ARTS FACILITIES – yes even those who teach MMA and UFC style fighting, have respect for each other, their students, etc. There aren’t very many bad apple schools – and if you find one, you should know it right away. It’s vital that you find a place that is respectful not just because it looks good, but because it’s an ingrained part of the school Culture. Our martial arts school is a traditional martial arts school that teaches Self-Defense, not a Self-Defense school that just teaches techniques. So with us, there’s no doubt that Respect foremost in our school’s “Culture” – from the front desk to the mat, we give it to get it, not the other way around. Imagine what it would be like if school teachers just showed up to class and taught whatever they wanted – no syllabus, no [structured] curriculum – just by the seat of their pants, based on their own experience. It would certainly be fun for the teacher (ant the students) for a while, but eventually, the teacher would run out of “experience” and the student would run out of “preparation” – meaning, they wouldn’t be ready for the next, harder set of challenges. Be sure that the program you choose doesn’t just teach by the “Seat of their Pants”. What amateur instructors (and some instructor have been teaching or decades but are still essentially amateurs) don’t understand is that what’s “fun” for the experienced instructor isn’t necessarily appropriate for the learning student. At our martial arts school, our curriculum isn’t just structured, it’s flexible as well. Flexible enough to be individualized (allowing people with different goals to approach the same technique or challenge with varying levels of intensity and purpose) to YOUR CHILD as a student. In fact, it’s part of our staff’s responsibilities to review classes each day and note anything that WASN’T flexible for a student. Then we work together with our decades of Martial Arts and teaching knowledge to ensure that it’s fixed – that week. It’s important that a good Self-Defense program be housed in a good facility, for Safety, comfort, and proper training. There should be proper safety mats on the floor, up to date equipment in good working order, etc. You do NOT want to take class somewhere that’s dirty, unkempt, or just plain run-down. Our facilities aren’t just clean (our staff has a daily cleaning checklist that includes not just cleaning at the end of the day – but throughout the day’s classes – you’ll often see them cleaning areas while you’re actually working out), they’re modern, bright and classy. Our goal is to make you FEEL comfortable and BE safe. 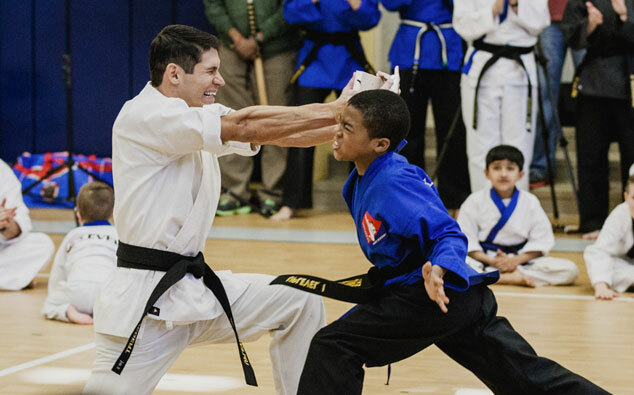 If you find a Martial Arts program for Kids in a great facility, you’re probably well on your way to finding the #9 thing to look for – a great atmosphere. Is the staff friendly? Do the other students welcome you into the group? Are the instructors personally invested in your success? Is everybody just plain happy, all the time? Ideally, you should encounter all of this and more. This is the atmosphere that keeps you coming back to class again and again, eventually reaching your goals. And we LOVE that they love it! I just mentioned that our staff are all professional martial artist, and this is a vital distinction. Any program that is worth your time needs to be run by a PROFESSIONAL martial arts school. 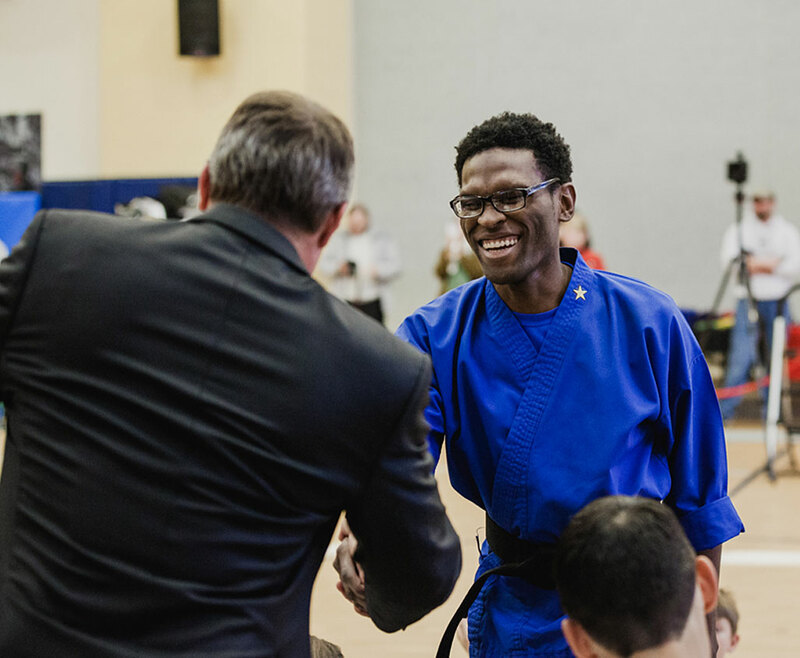 If you’re going to reach YOUR goals, you need to be sure that the teacher you’re with has the capability to understand you – they need to eat breathe and live Martial Arts and Self-Defense. What good does it do you if you’re learning VITAL techniques, essentially, putting your LIFE in the HANDS of someone who isn’t committed to you? BE sure you find a school that employs full time employees, and trains and treats them as such. Our employees undergo rigorous training on a daily, weekly and yearly basis. I don’t say that because it’s IMPRESSIVE, I say that because it’s IMPORTANT! In fact, it’s not actually required – there are NO STATE OR FEDERAL REGULATIONS REGARDING MARTIAL ARTS FACILITIES! So it’s very, VERY important that you choose a facility that regulates, educates and trains its staff members! It HAS to be FUN! 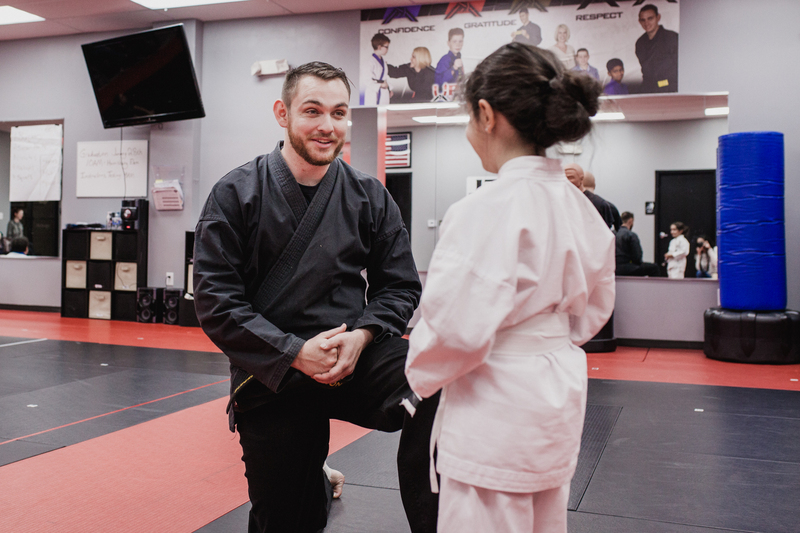 We’ve been teaching Martial Arts to kids here at our martial arts school for a while, and we figured out a LONG time ago, that if our younger students were going to get good at Martial Arts, they have to REGULARLY come to class. If they came to class and it was boring and terrible, they weren’t going to come at all! So we had to find a way to keep kids FOCUSED while having FUN, and over the years we’ve really perfected it. .
We literally use FUN and FOCUS as a way to improve the Quality of Life of our students. They love it, and you’ll love it too! If you’re ready to get started with your Free Trial Program, check your email and click one of the links. We’ll answer your questions, and get everything setup for you.